The entity framework creates a model of your database, a .edmx file. If you open the file and close it, then you can’t open it again until you close visual studio and reopen it. That no fun. You will get a choice of what you want to open the model with. If you choose XML Editor you will be able to open just the xml. (If may warn you that your model is already open and will ask if it can close it, choose yes). Now it’s open, but you see all the XML. 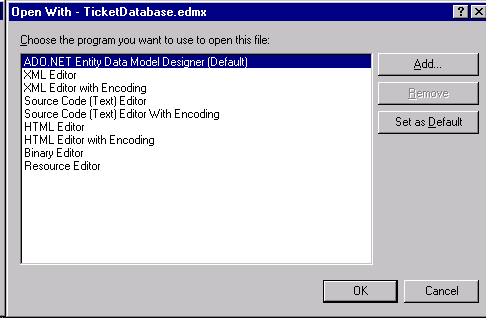 Right click on the edmx file again and choose Open. Your model will open back in the familiar view that your used to. This entry was posted in Entity Framework and tagged ADO.NET Entity Framework, Computer file, Context menu, Data Formats, Entity Framework, Programming, Tools, XML. Bookmark the permalink. 1) As far as I know, this behavior only happens when you modify the EDMX in the designer and close without saving changes. I saw a video you did about EF 4. I can’t wait until it’s released.